A bitter and divisive power struggle that has been simmering behind the scenes for years within the Stronach family is about to boil over very publicly in a court of law. WOW - this is NASTY!!! It's probably going to take a fleet of forensic accountants to figure out whether there has actually been financial malfeasance by the defendants. I can't help but think about the fact that Frank is 86. I know some octogenarians are still mentally sharp...but many of them aren't. Is this a case of a proud, stubborn, elderly man having a fit because the family decided to take the car keys away from him? Frank got bored just having a huge commercial empire, told Belinda she was in charge, and invaded Austria. Belinda likely messed up an investment or 2 and along with one of Frank's trusted accountants/lawyers has been trying to fix things and not always succeeding. Frank finally, after taking over Austria, learned that Belinda and the deputy were not always successful, told Austria to behave if it knew what was good for it and flew back to yank on the reins, throw Belinda into the back pasture and get the horse collar back on his former deputy and get him back in the furrow. No one listened. The wife liked having new clothes, and the kids had tossed the uniforms and discovered that the WWF had some cute girl costumes again. They pretty much yelled "Hell no, we won't go!" This eventually caused Frank to have yet another tantrum, this time in court, since yelling doesn't seem to have any effect any more. No, in Frank's case, it was taking away the keys to the bank vault. No matter what you think of the Stronach businesses, I think this is very sad. Probably doesn't want to talk about it. His own venture into Austrian politics pretty much flopped. Paulick interview with Belinda Stonach and Tim Ritvo covers a wide variety of topics, including shooting for a BC @ Laurel in a few years. Well, congratulations on being in a position to lose $380,000,000 and survive rather nicely. 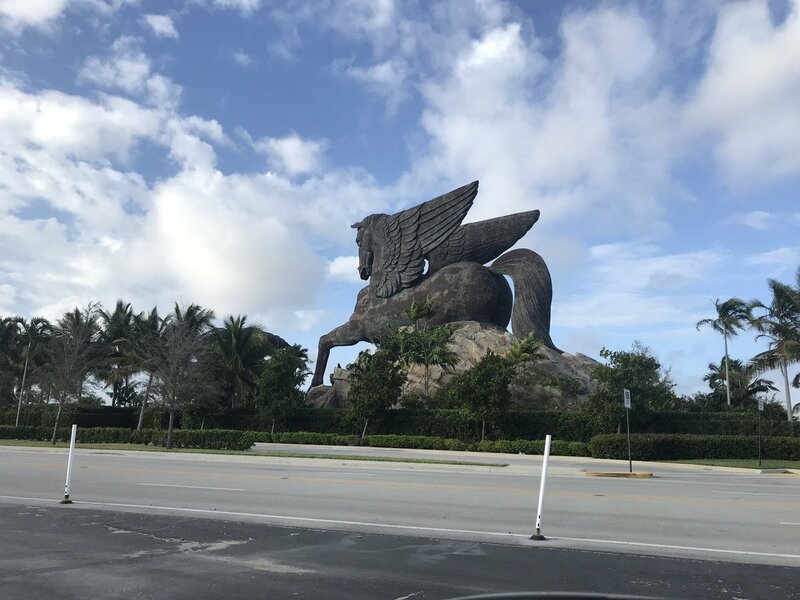 Someday in the not too distant future I can envision the Pegasus moving to the West Coast, the real question is where will the statue(s) go? Santa Anita top of the turf hillside for all to see from a distance. Across the street at the Arboretum. I wonder how the taxpayers of Baltimore feel about this. Although I doubt many of them reading racing publications. This game is so powerfully corrupt. In the meantime, lots to enjoy and appreciate at NYRA. Glad we're not the dysfunctional ones anymore. Not limited to horse racing. Two words you may not be familiar with.........AL DAVIS. $55 million for a Van Gogh I could see. That much for two really, REALLY ugly statues is over-the-edge stupid. Hey, they have to be best at everything. "Pimlico would be expensive to fix so let's just close it and move the historic race to Laurel uwu"